Human rights campaigners are warning that further ethnic cleansing in Burma, which is being exacerbated by land clearances due to economic developments surrounding the Shwe Oil/Gas pipeline, could be imminent. The Shwe pipeline, which ironically means Golden in Burmese, is due to open later this year. It will allow oil from the Gulf states and Africa to be pumped to China, bypassing a slower shipping route through the Strait of Malacca. It will also ship gas from off shore western Burma’s Arakan State, to southwest China. Last year there were two massacres against the Rohingya, an ethnic Muslim-minority population who inhabit Arakan state, including the strategic port of Sittwe, which is the start of the pipeline on the Burmese coast. 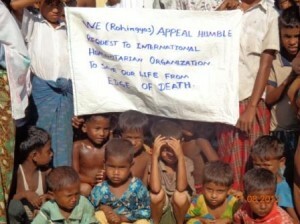 There are credible reports that the Burmese military is involved in the ethnic cleansing. Described by the UN as being amongst the most persecuted people in the world, the Rohingya have been described as the “world’s most forgotten people“. 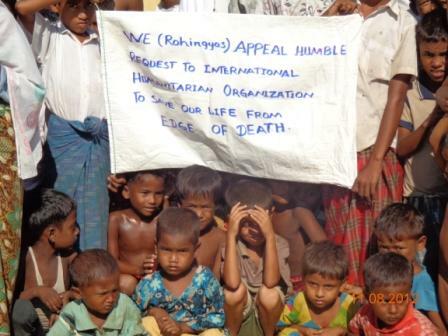 The massacres against them occurred in June and then again in October, with over 120000 now living as displaced people in camps in the state of Arakan, and many more having left for Bangladesh and further afield. It seems to have become a world tradition that OIL takes precedence over the lives of innocent men women and children. When will they ever learn? much injustice being dealt out to a particular group of people. We need many more like her ! there have been a few riots in Rakhine State of Myanmar, which resulted in deaths of both Bengali-speakers AND Arakanese-speakers; there has been no “genocide”. Genocide is what Pakistani Sunni’s are doing to Pakistani Christians. The whole world knows that. Please stop these unnecessary deaths of innocent people. Their lives are important and precious! They don’t deserve to be treated inhumanly in order to make wealthy people even more wealthier. please try and get them to hear us!! this has to stop now!!! NO OIL IS NOT A GOOD REASON FOR GENOCIDE !!!!!!!!!!! !